House Minority Leader Nancy Pelosi, D-Calif. holds a news conference following the 2018 midterm elections on Nov. 7, 2018. 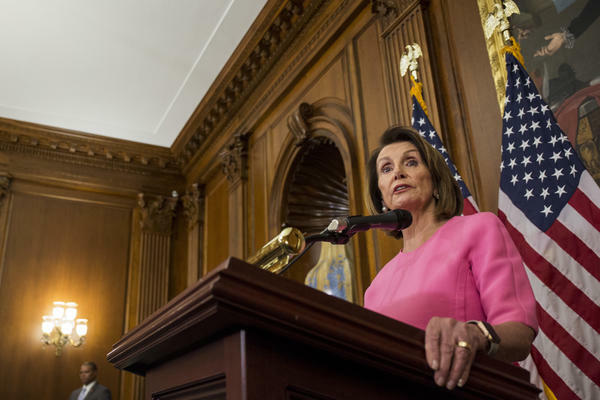 Pelosi expects to lead the House Democrats and plans an agenda focused on promoting campaign finance reform, an expansion of voting rights and overhauling political redistricting. Democrats will take control of the U.S. House in January with big items topping their legislative to-do list: Remove obstacles to voting, close loopholes in government ethics law and reduce the influence of political money. Party leaders say the first legislative vote in the House will come on H.R. 1, a magnum opus of provisions that Democrats believe will strengthen U.S. democratic institutions and traditions. "It's three very basic things that I think the public wants to see," said Rep. John Sarbanes (D-Md. ), who spearheads campaign finance and government ethics efforts for the House Democratic Caucus. He said H.R. 1 will "demonstrate that we hear that message loud and clear." But even Sarbanes admits the quick vote is just a first step. Republicans, who control the Senate, are unlikely to pass the bill and President Trump is unlikely to sign it. "Give us the gavel in the Senate in 2020 and we'll pass it in the Senate," Sarbanes said. "Give us a pen in the Oval Office and we'll sign those kinds of reforms into law." The bill would establish automatic voter registration and reinvigorate the Voting Rights Act, crippled by a Supreme Court decision in 2013. It would take away redistricting power from state legislatures and give it to independent commissions. Other provisions would overturn the Supreme Court's Citizens United ruling, which declared political spending is First Amendment free speech; they would mandate more disclosure of outside money and establish a public financing match for small contributions. Ethics language in the bill would strike closer to current controversies. When President Trump took office, he said — accurately — that the ban on conflicts of interest doesn't cover presidents. The bill would close that loophole, while expanding the anti-bribery law and requiring presidential candidates to make their tax returns public. Much of what's proposed in the Sarbanes bill is controversial. "A lot of it looks to be unconstitutional," said David Keating, president of the Institute for Free Speech, a group that's opposed to many campaign finance regulations. "They say they want to amend the First Amendment," he said, referring to the language repealing Citizens United. "What gives government the right to regulate speech about the president and Congress?" Democrats reject that analysis. "The path back to having the public trust government and politics is a long one, but we have to start someplace," Sarbanes said. New conflicts will emerge to fuel the reform debate, as House Democrats ready their long-promised investigations of the President Trump and his administration. Multiple congressional committees are all expected to dissect Trump's domestic and overseas businesses, his campaign's contacts with Russian businessmen, spending by foreign officials at his Washington hotel, the ethics problems of cabinet officials and an assortment of other issues. Trump critics suggest the probes could damage his presidency, with Trump and his defenders moving quickly to cast the oversight as a witch hunt. At a post-election press conference Wednesday, Trump said that if House Democrats start issuing subpoenas, he said he would task Senate Republicans to reply back with subpoenas of Democrats, "and it'll probably be very good for me politically." Senate Majority Leader Mitch McConnell, speaking with reporters, was dismissive of the Democratic strategy. He called it "presidential harassment," and said Republicans tried it in 1998, when they impeached President Bill Clinton. "His numbers went up and ours went down," McConnell said. "And we under-performed in the next election. So the Democrats in the House will have to decide just how much presidential harassment they think is a good strategy."